Working full time on Lake & Pond Management... so you don’t have to. 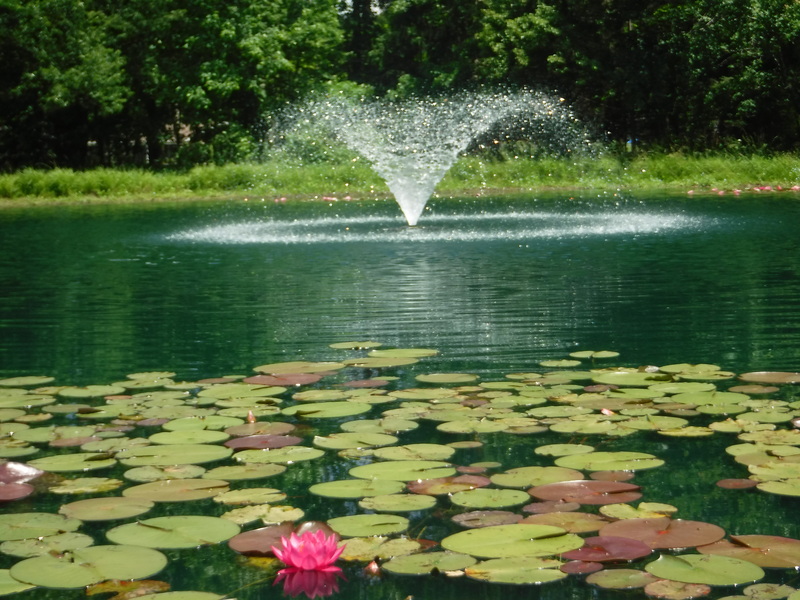 Floating fountains and surface aerators provide the pond owner with both aesthetic beauty and improved water quality. These aerators work by creating a spray pattern which absorbs atmospheric oxygen above the surface which is then released when the droplets hit the water. Floating fountains also create wave action which reduces stagnation. 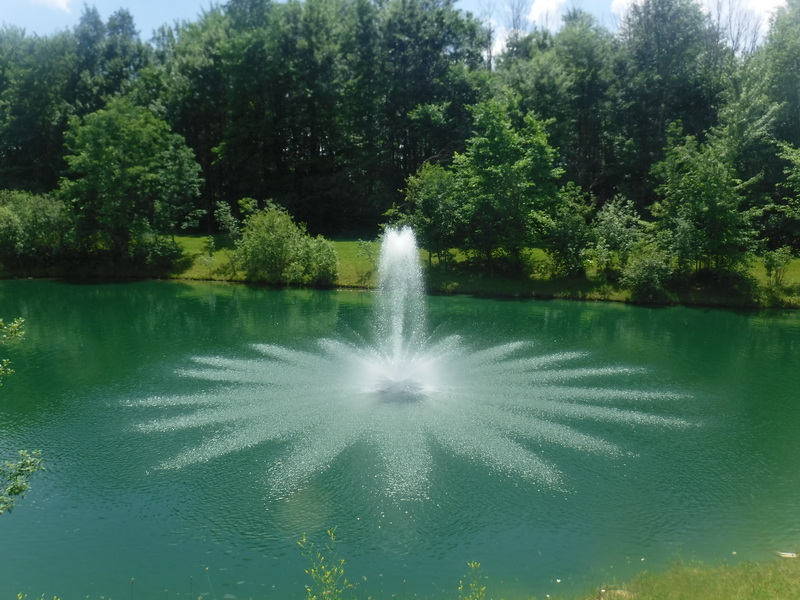 Floating fountains and aerators are available in a variety of sizes and styles: surface aerators feature classic v-shaped and volcano patterns whereas floating fountains offer many spray patterns from traditional to elaborate. Optional LED lighting is also available to complete the aesthetic appeal. Contact AQUA DOC for a free consultation and our aquatic specialists will offer expert guidance in choosing the right fountain or surface aerator for your water. The Masters Decorative Series is a ½ HP Masters Fountain with a Classic LE float. 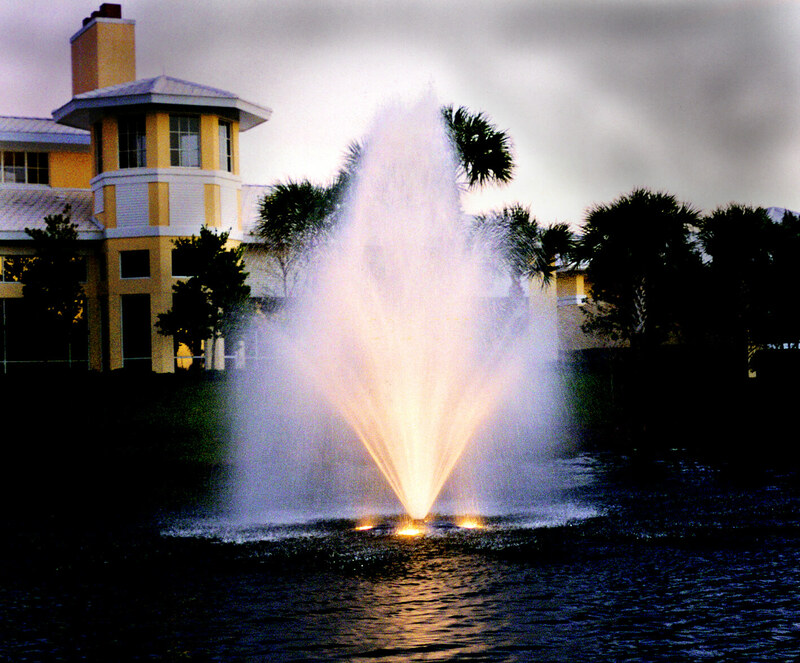 This allows the user to get the performance of a Masters series fountain at a lower cost. All existing ½ HP Masters Series® patterns are available on the Decorative Series. Fountains are available in 120V 1PH and 208-240V 1PH. Discover the Power & Beauty of the Masters Series® by AquaMaster®. These revolutionary fountains are available in a wide variety of spray patterns. All Masters Series® (except Captiva & Kiawah) are interchangeable and provide you with the ability to change spray patterns. (Flow straightener may be required.) This flexibility gives you the power to create dazzling waterscapes while improving water quality. Complete system includes: 1/2hp 120 Volt Single Phase Fountain, Cable or Quick Disconntect Motor Lead, 100′ Mooring Rope and 2 Mooring Stakes, Controller with 24 Hour Timer for Fountain and Lights, Photo Cell, Torrent and Tornado Spray Patterns. Kasco VFX Series Aerating Fountains set the standard by which all aerating pond fountains are measured. These units deliver both superior oxygenation and aesthetic brilliance, making this a true dual-purpose fountain. As the leader in pond aeration, our VFX aerating fountains have been designed with our clog-resistant technology to ensure you are buying the most efficient unit on the market. Use our VFX Series in your pond, on the lake, in a landscaped water body, or even in industrial applications to help promote evaporation. These floating units are available from 1/2-5HP in a multitude of power configurations. The 1/2 HP Fractional Aerating Fountain & Mixer Series comes complete with 5 systems in 1; four interchangeable patterns, Gemini, High Volume, Rocket, Phoenix and a horizontal Mixer. Built on a similar platform as our 1HP-5HP lines, the Fractional Series is just as efficient but more versatile in that it can be used as both a surface spray system or easily converted into an underwater mixer. Ready to install out of the box and designed with the small pond owner’s needs in mind, the Fractional Series provides both aesthetic appeal and aeration, taking care of your water quality management needs. Click here to view a summary of the features and specifications of this Otterbine product. This unit is popular among those with back yard ponds, farm ponds, or anyone with ponds less than a 1/2 acre in size. * Fractional Series plus 2 Light Set with 6.5W LED bulbs, and an additional Mini PCC with timer, transformer, and photocell. * Quick Disconnect on unit and lights. The 11W LED light from AquaMaster® Fountains and Aerators offers a color diode board assembly LEDs in cool white,warm white, red, green, blue, and amber. Colored lenses are replaced with brilliant dedicated color LEDs eliminating any color washout. The 11W LED reduces power consumption, increases brightness and runs cooler using copper heat sink delivering a higher luminous efficacy—More light, less heat. 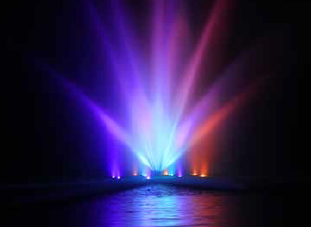 Aquamaster® Fountains and Aerators proudly introduce programmable, color changing fountain lighting to its Night Glow Lighting System offering. These new RGBW (red, green, blue, white) LED lighting systems consist of 20W fixtures, panel mounted controller and power supply that produce brilliant colors and shows. Customizable programming to meet color, show type, calendar and holiday events available. As with all AquaMaster LED Night Glow Lighting Systems, these new RGBW LED sets are constructed of high quality stainless steel, operate efficiently with minimal cost, long lasting, and backed with a 3 year warranty. Aquamaster® Fountains and Aerators proudly introduce programmable, color changing fountain lighting to its Night Glow Lighting System offering. These new RGBW (red, green, blue, white) LED lighting systems consist of 40W fixtures, panel mounted controller and power supply that produce brilliant colors and shows. Customizable programming to meet color, show type, calendar and holiday events available. As with all AquaMaster LED Night Glow Lighting Systems, these new RGBW LED sets are constructed of high quality stainless steel, operate efficiently with minimal cost, long lasting, and backed with a 3 year warranty. AquaMaster® is proud to introduce its new energy efficient, high lumen output LED lighting for floating and fixed base fountains. LED Lighting Systems consist of LED lamps housed in all stainless steel (SS) submersible fixtures, SS mounting brackets, SS braided fixture jumper cables, electrical controls in unit panel and 50 feet (½-5HP models) or 100 feet (7½and higher HP models) of power cable with AquaLock (ALC) quick disconnect (additional cable ordered as required). All LED lenses can be positioned above or below water. Housing should remain submerged for cooling purposes. 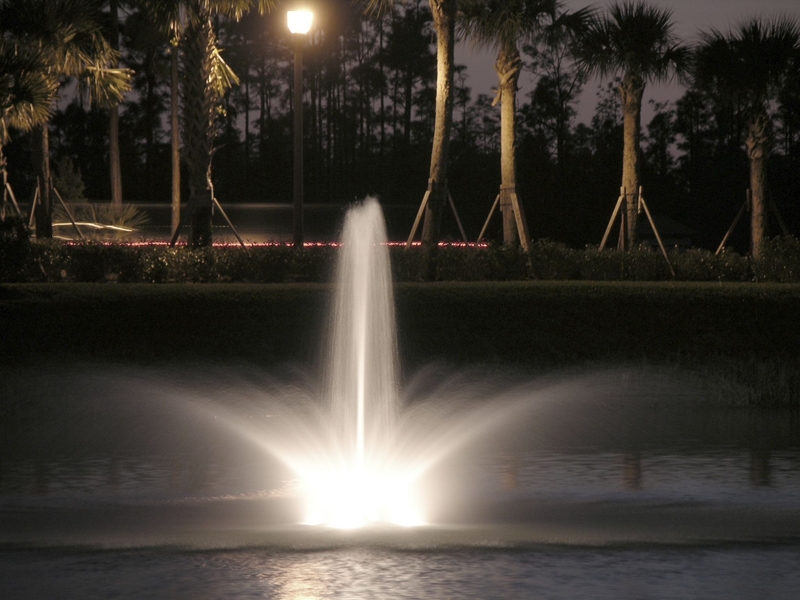 Kasco has fountain lighting solutions for all our fountains with our state-of-the-art LED lighting options. Our all-LED offering guarantees energy efficiency so you can enjoy fountain lighting without worrying about your electric bill. Kasco’s LED Lighting is designed and engineered to be the most reliable fountain lighting on the market. Using a one piece composite housing and a lens that’s been ulrasonically welded and guaranteed to stay in place, you can trust Kasco’s lighting to be leak-free and brilliantly lit for hours of enjoyment. Fountains make beautiful and dramatic displays. Why not add lighting so you can give your fountain life after dark?